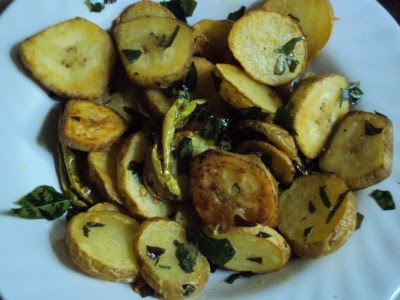 Yes the raw banana or plantain, commonly called as kachha kela can be made into a quick fry like potato finger chips. After the yam chips fit for a nice chai time snack here comes a fry which can be had as meal during fasting with a bowl of fresh curds . This kind of a meal is an easy one step recipe involving shallow frying . The oil content is low as the shallow fried slices are drained on kitchen tissue . 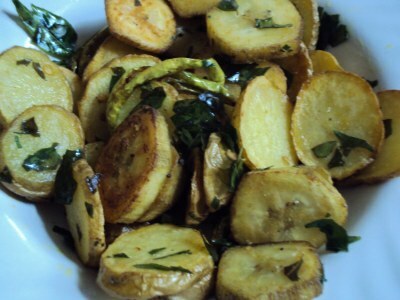 I used unpeeled new baby potatoes and thinly peeled (using a potato peeler) raw plantain . For one serving you need one plantain and 2-3 baby potatoes . Slice both the vegetables into 1 cm thin roundels . Slit one or two green chillies and chop a handful of curry leaves . Heat oil in a kadai and throw in the slit green chillies and curry leaves first in the oil , quickly followed by potato and plantain slices together. Shallow fry them in medium low hot oil ( ghee or peanut oil are used during fasting ), till lightly browned . they remain soft inside and lightly crisp on the surface. Add salt ( rock salt for fasting ) to taste . Sprinkle turmeric water a few times while shallow frying the slices for a nice yellow color. The slices need to turned and stirred continuously as while shallow frying they may get burnt on one side and stay raw on the other. With a bowl of fresh curds , it is a nice meal , ready within 10 minutes starting from slicing the vegetables. This not a fattening meal as both the vegetables are complex carbohydrates and they are cooked along with their skins . Fat content is low and curry patta and green chillies make it even more healthy. I do not discard the curry patta and the green chillies visible in the picture as they taste great with the slices. Nice combo!! I love anything that contains plantain. i love yam, potato and plantain.. but the most unfortunate thing all these 2 raise my sugar levels.. I would finish off a bowl of rice, with yam or potatoes. I used to add potatoes in almost anything..but now stopped it.